More info see Official Site. A fantastic opportunity to play in downtown Budapest. There will be a GM norm, IM norm and Open running concurrently. This year will be my third time playing in this wonderful event. Purpose of tournament: To provide young players the opportunity to try themselves against experienced Grandmasters and International Masters, on the occasion of this tournament for GM and IM norms, organized by the Budapest Chess Federation (BCF), the Aranytíz House of Culture and Sárkány DSE. To strengthen chessfriendship. Date of tournament: 16-24th August 2014. Place of tournament: Aranytíz House of Culture, 1051 Arany János str. 10. Arbiters of the tournament: IA IM Gyula Fehér, NA FM András Bernei. Participants of the tournament: Three Grandmasters and seven International and FIDE-Masters in the GM group. Three International Masters and 7 FIDE-Masters and Master candidates in the International Master group. No restrictions for the IV. Budapest Open. GM Jones(ENG) and three others share the lead with 5.5/7. The followup was 24..Bc4! and both White knights have pin problems. 25.f4 Bxc5 26.Be5 Qg6 27.f5 Qh5 28.Rfe1 Qg4 30.Rcd1(Diagram) White’s Nd4 continued to have pin problems. Rapport finished nicely with 30..Rxe5! (chopping off a defender of Nd4) 31.Rxe5 Bb3(attacking another defender) and the game ended soon after. IM Fancsy Imre won again and keeps the overall lead with 6.5/7. There was plenty of action today on the top boards. Black just played 33..a5(diagram) but had horribly weak kingside dark squares. White continued with 34.Rhf4 and eventually broke through with Rxf7 and won decisively. The game began quietly with an English Opening. After 20..Be6(diagram) Black’s queenside is under some pressure. The surprising blow 21.Bd6! followed forking c7 and e5. 21..cd 22.c7(continuing the fork theme) and White won on move 28. 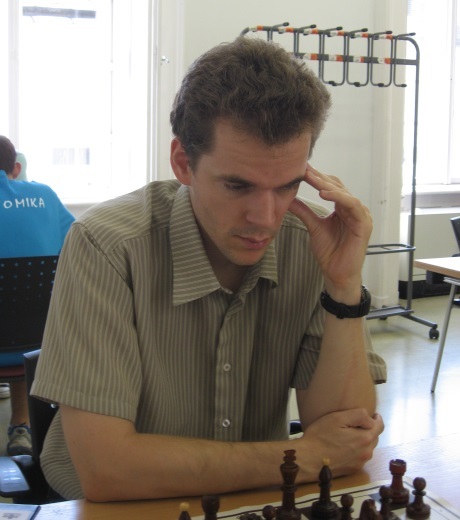 GM Horvath,Josef is the lead instructor for the Maroczy Chess School, Hungary’s national chess academy. The top 2 boards drew as IM Fancsy Imre stays in clear first with 5.5/6. IM Fancsy Imre keeps the overall lead with 5.5/6 with a draw today. GM Kovchan Alexander has clear first so far with 4.5/5. Plenty of blood was spilled today. IM Baumegger Siegfried beat GM Rapport who is having a tough time this tournament. White continued with a queenside attack and played 26.a4. After White won an an exchange, Black eventually resigned on move 40. IM Fancsy Imre won again and has clear first with the only perfect score 5/5. Unrated Ivanov Ilya beat Juhasz Judit(1619). Well done! Four players share the lead with 3.5/4. Note Chess.hu has up to date PGNs. GM Horvath,Cs ground out an extra pawn in an Alekhine’s Defence. White continued with 33.g4 and lost control. In more exiting action, GM Czebe(as White) had a strong bishop pair for rook and 2 pawns against the promising talent Kozak,Adam. After 25..Qh6 Czebe found 26.Bd5! and Black’s queen was short of squares. 26..Rd6 27.Be3 Qh5 28.Rg5. Black gave up the queen and resigned shortly after. The big guns won as expected. Ashley Tapp(CAN) was paired up again and suffered a third consecutive defeat. Toth,N also lost. There is a 3-way tie for first-Fancsy,Kiss and Okhotnik have 4/4.